The following survey was released by the United Nations Office on Drugs and Crime on December 18, 2013. 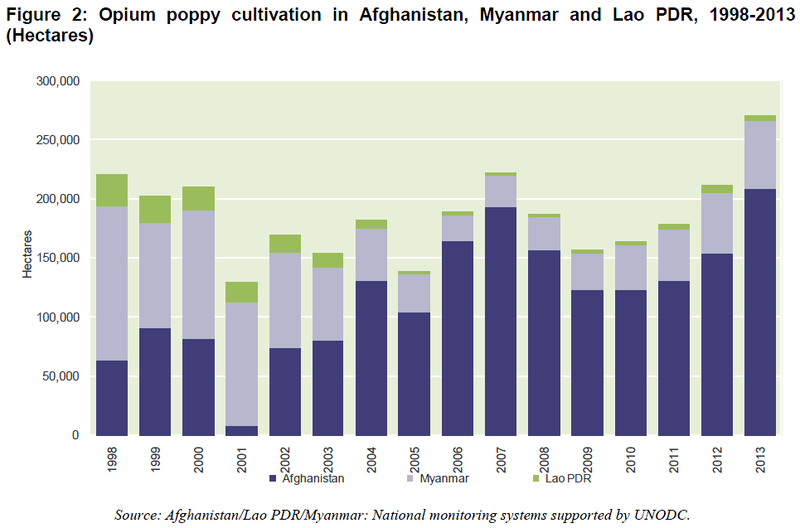 Despite a consistent downward trend in opium poppy cultivation from 1998-2006, when Myanmar experienced an 83% reduction and Lao PDR saw the largest relative decline among the three countries, opium poppy cultivation in the region has since increased, though at a relatively slow pace. According to government reports, opium poppy cultivation in Thailand has remained stable at a very low level. However, opium poppy cultivation in Myanmar increased from 21,600 hectares in 2006, the year with the lowest level of cultivation, to 57,800 hectares in 2013. In Lao PDR, it increased from 1,500 hectares in 2007 to 6,800 hectares in 2012. In 2013, 3,900 hectares were estimated, but due to differences in methodology compared to 2012, a trend could not be established. Thus, overall, opium poppy cultivation in the region has more than doubled since 2006, this despite official reports from the Governments of the three countries indicating that a total of 12,949 hectares of opium poppy were eradicated in 2013. Myanmar remained the second largest opium poppy grower in the world after Afghanistan in 2013, with Lao PDR accounting for only a very small proportion of the global total. In South-East Asia, opium poppy is mostly cultivated on steep hills with poor soil and no irrigation, and opium yields are much lower than in Afghanistan, where opium poppy is often cultivated on good soils and flat, irrigated land. 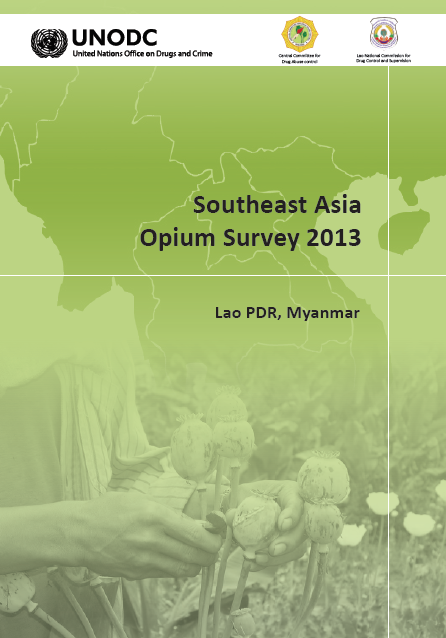 In 2013, opium yields were estimated at 6.0 kilograms per hectare in Lao PDR, 15.0 kilograms per hectare in Myanmar and 15.6 kilograms per hectare in Thailand. In 2005, Lao PDR and Myanmar together produced 326 tons of opium, or 7% of that year’s global opium production of 4,620 tons. In 2013, the two countries produced 893 tons, or 18% of the total opium production in 2012. While the area under poppy cultivation in Myanmar increased by 13% in 2013, the number of households growing poppy remained roughly the same, as farmers on average dedicated a larger portion of their land to poppy cultivation than in 2012. The average area of poppy per opium growing household more than doubled from 0.17 hectares in 2002/2003 to 0.43 hectares in 2013. This implies a larger dependency of those households on opium. Furthermore, the Myanmar survey found that many households not only earn income from the cultivation of opium poppy on their own land, but also by labouring in the poppy fields of other farmers. Alternative development projects thus need to address both of these groups, as a reduction in poppy cultivation for many households means the loss of an opportunity to generate income from poppy-related wage labour. There is a strong link between poverty and poppy cultivation. In poppy-growing villages in Myanmar, significantly higher proportions of households are in debt and are exposed to food insecurity than in non-poppy-growing villages. Furthermore, households in poppy-growing villages on average suffer longer from food insecurity than households in non-growing villages. Thus, in poppy-growing villages, opium cultivation seems to be a means to earn cash income in order to purchase food in months when households’ food resources have been depleted. In other words, poppy farmers try to compensate for a lack of alternatives in their opportunities for earning income in order to subsist. Income patterns in poppy-growing and non-poppy growing villages in Myanmar are complex and differ in much more than just poppy cultivation. Despite indicators of greater vulnerability (as seen in higher levels of debt, food insecurity and drug use), households in poppy-growing villages in all regions, with the exception of East Shan, had a higher average income than those in non-poppy-growing villages. On the other hand, households in non-poppy-growing villages had better access to salaried jobs and petty trade. In Lao PDR, no socio-economic survey of poppy-growing villages was conducted in recent years. The data from the helicopter flights and satellite image analysis indicated that poppy cultivation continued to be a phenomenon linked to villages in peripheral, difficult to access locations, far from population and market centres. Risks and opportunities associated with different income patterns in poppy-growing and non-poppy-growing villages need to be investigated in more detail in Myanmar but also in Lao PDR to understand how livelihood risks can be reduced and the resilience of households can be improved in the context of efforts to contain and reduce households’ dependence on poppy cultivation.